Swiss brown mushrooms are related to the white agaricus variety, with brown skin rather than white. 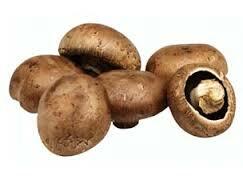 Their flavour is stronger than white agaricus, making them good for use in risottos, casseroles and soups. Portabello mushrooms are mature Swiss browns, whose caps have fully opened. Swiss brown mushrooms are available all year round.